Join the discussion on our forums! Come discuss Krul the Unshackled over in our dedicated Krul the Unshackled discussion topic. I am mostly Wild player,and Krul the Unshackled is very good in Renolock deck,many times he deliver me a win jumping in play with cards like Doomguard and Voidlord :) So i like it so much,even crafted Golden version :) So those who like Reno style deck definitely should craft Krul. Turn 9: Play Krul, summon demons out of hand. Opponents turn: clears your board. Turn 10: Play Bloodreaver Gul'dan, get all of your demons back. A little trivia fact: Krul is technically the most powerful creature according to Lore in Hearthstone to date. He's not a simple demon that made it's way into the Kabal, rather an incredibly powerful Voidlord that is capable of destroying entire planets. 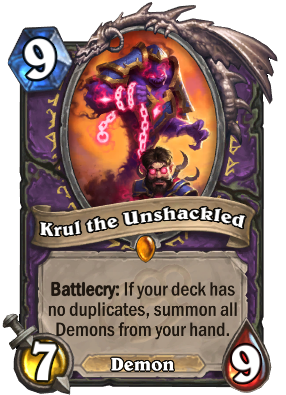 Although even more powerful Void Gods exist (like Entropius), Kruul can easily devour and destroy characters like Ysera, Ragnaros, Y'shaarj, etc. "Both Krul and Spicklefizz are unique to Hearthstone." He is the void. He is your nightmare. RenoKrul is a fun deck, but I'm not sure it will be viable without Reno. Who's a guy at bottom of the card art? Some gnome, being controlled by the demon. Normally it's the other way around. Voidwalker attack: As you command. Krul attack: As I command. If you have Mal'Ganis I recommend trying Reno Demonlock in Wild. Its actually a pretty fun deck to play there. anyone i will reach rank 1 with this deck and new reno mage one day !!! if anyone have a good competitive Deck tell me. thanks. Surprisingly useful legendary. You can always add some demons to your hand with Kazakus Potion. And there are situations when you prefer to see Lord Jaraxxus as a 3/15 minion (play around burst damage, Sacrificial Pact etc). This is a whole new brand of Reno deck. This is Krul'lock. Is this Zeratuls voice from the Star craft ?